Thanks Bear. Basic points for motorcyclists... Noise test is done stationary. Meter is to be 500mm from exhaust at 45 degree angle and same height as exhaust. HD's revs at 2500, all other bikes 3000rpm. In SA pre 85... 100 db, post 84... 91db. Yeah, this bit interested me, More than 300mm apart, and they use 2 mic's. May be the difference between getting thru Rego, or not. Some wannabe smartRR's engineer could ping you for 2 dba over the limit, on one side. Ooops, sorry guys, didn't think that control bar would be in the picture. Post 88... Lowest part of handgrip must be less than 380mm above lowest part of upper surface of riders seat. Hang on a minute. So if your bike is post 1988 they measure a height difference between the lower parts of the handgrip and lowest part of your seat, but they don't on pre 1988? 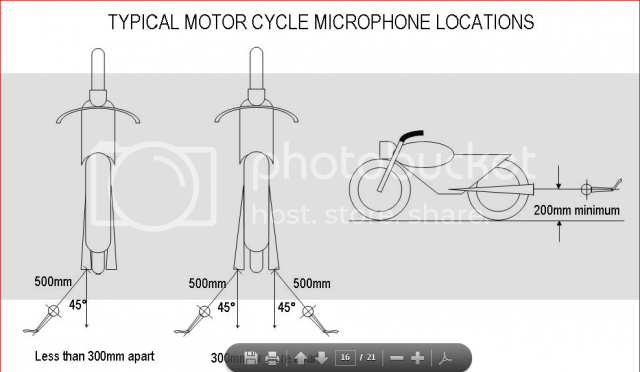 Meaning pre 1988 we've got a lot more scope legally for tall bike and handlebars? Prof mentions mudguards earlier for QLD it is 45 degrees. I would be interested to hear how people interpret page 12 of the second link. It would appear the 550 rule is only applicable post 88. An engineer in Qld said it did not apply to pre 74. Pre 88 would be fantastic.